At ROSS Management Services, we have no higher priority than resident satisfaction. Every minute of every day, our onsite property management teams are dedicated to giving our residents the highest-quality living experiences. Therefore, we were incredibly gratified when we learned that, for the second year in a row, our firm has been honored by SatisFacts’ annual National Resident Satisfaction Awards. 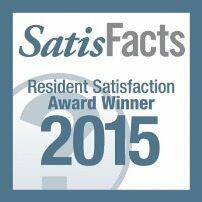 The awards are based on satisfaction scores residents gave them on SatisFacts surveys. Our residents gave ROSS Management Services an average score between 4 and 4.49 during 2015, placing our firm in the Superior Company Score category. Metro 710 in Bethesda, Md. Our property management teams deliver customer satisfaction surveys to our residents at least three times during their lease term – at move-in, after every work order and prior to renewal – to determine their satisfaction with the level of service they have received. We also encourage on-site staffs to deliver high customer satisfaction through our annual Customer Service Circle of Excellence Awards, which honor leasing associates and apartment communities that provide great customer service, which is benchmarked using the community’s SatisFacts scores.